Each year CMS rates Medicare Advantage prescription drug plans (MAPDs) and stand-alone Medicare prescription drug plans (PDPs) on a scale of one to five stars based on health care outcomes and beneficiary satisfaction with, and access to, services. In 2012, it also introduced specific weighted Medicare Part C and Medicare Part D quality measures to drive improvements in those areas. A plan’s rating can mean financial incentives or penalties to plans. MAPD plans earning overall ratings of four stars or more receive quality bonus payments to fund additional benefits to beneficiaries. Plans consistently earning below three stars for three consecutive years risk termination from CMS programs. MAPD and PDP plans with five stars can enroll eligible members who want to change plans throughout the year, not just during the annual enrollment period. CMS annually publishes these ratings in early October. They are available on the agency’s Medicare Plan Finder website in advance of open enrollment. The incentives seem to be working as the number of highly rated plans has grown steadily. Of the 57 million Medicare beneficiaries in 2016, approximately one-third are enrolled in private insurer-offered Medicare Advantage plans. And of the Medicare Advantage plans that offer prescription drug coverage, nearly half earned four or more stars for the year – a 9 percent gain from 2015. More than 70 percent of enrollees in Medicare Advantage PDPs are now covered by contracts with four or more stars. CVS Health’s Medicare leadership team and Medicare specialists actively work with CMS on star ratings quality measure development so that we can amplify our clients’ voices by representing their views. Key members of our Medicare team serve on the board of directors for the Pharmacy Quality Alliance (PQA), the nonprofit organization that develops and implements medication management performance measures. In addition, our colleagues serve on nine out of 11 PQA measures development teams, each formed through a competitive application process, and on all four PQA stakeholder advisory panels – as well as several PQA task forces and special workgroups, as appointed. We share our experience and thinking with the agency as officials make policy decisions about star ratings quality measures. One key area where this helped a client achieve a positive result is in helping CMS understand the burdens faced by plans serving large groups of beneficiaries who qualify for low-income subsidies. We also utilize this relationship to build programs that support star ratings measures, monitor client performance and drive improvement initiatives. We share our insights with our MAPD and stand-alone Medicare PDP clients through an ongoing dialogue about changes to the star ratings measures. For the plan year that starts January 1, 2017, CMS has defined nearly 50 Medicare Part C and Part D quality measures. Plan performance will be reflected in the 2019 star ratings the agency is expected to publish in October 2018. So now is the time to implement improvement policies and procedures to positively influence ratings. CMS prioritizes clinical quality measures such as adherence to diabetes, hypertension and cholesterol therapies. In fact, adherence accounts for approximately 30 percent of star ratings, and clients can benefit from our expertise in this area and the programs we offer. Every day, we provide care to approximately 11.8 million Medicare beneficiaries – through our own four star-rated SilverScript Insurance Company and on behalf of more than 40 clients with their own Medicare offerings. Our experience has been that year-over-year improvement in CMS star ratings performance begins with close operational oversight and a commitment to continuous learning. Utilize tools such as predictive analytics to help identify beneficiaries most in need of additional support. Knowing the therapeutic point at which to engage the beneficiary increases the effectiveness of the intervention. Programs such as Pharmacy Advisor can provide timely support to members most likely to benefit from them. Review overall star rating performance with senior leaders and executive sponsors of clinical and operational measures with a focus on two or three key areas to stimulate creative thinking and achieve superior performance across the business. Encourage collaboration among teams through regular reviews of measure performance hosted by the executive sponsor for each measure. This also provides a forum to identify additional opportunities and challenges. Understanding the beneficiary experience can help identify opportunities for improvement that translate into high Consumer Assessment of Healthcare Providers and Systems (CAHPS) and call center monitoring scores. Grievance and complaint tracking, and ad hoc survey results can also help to determine steps for improvement. Integrate the plan’s needs into a provider’s workflow. Financially incentivize providers to improve outcomes and reduce costs. Pharmacists can influence several clinical and operational star ratings measures, including complaints about the drug plan, voluntary disenrollment and CAHPS results related to obtaining prescriptions. Pharmacists can also help with adherence and medication therapy management, and counsel members about gaps in care and use of cost-effective generics. Plans can work with their PBM to deliver these interventions. Performance-based reimbursements and performance incentives for pharmacists similarly provide a year-end incentive based on achieved results. Empower customer care representatives to resolve a beneficiary’s concern during the initial inquiry to improve first-call resolution performance. Empathy and engagement training for these representatives may similarly boost beneficiary satisfaction. business and for non-PBM member populations. Finally, it is important to stay connected with beneficiaries so there are no surprises when star ratings are published. Mock CAHPS surveys can, in real-time, help identify and correct issues that could otherwise derail year-end results. Our star rating dashboard provides clients with a bi-weekly summary of key metrics to benchmark and monitor performance. We can also work with clients to help manage their program by utilizing detailed provider- and member- level data that pinpoints opportunities for action. Each year, CMS revisits individual star ratings measures, including the underlying methodologies and thresholds. Flexibility in operating in this dynamic environment may be one of the costs necessary to ensure star ratings track the right metrics and that program outcomes align with larger CMS objectives. Monitoring what changes CMS is considering and tracking the agency’s announcements can help plans stay informed about when the new or modified criteria might be implemented. This allows plans to respond to CMS requests for comments, influence how measures are implemented, revised or retired, and be ready with the resources needed to meet the corresponding targets. The CVS Caremark Medicare team has years of experience providing care to SilverScript members and those of our clients with Medicare offerings. We understand what is required to deliver good health care outcomes and earn top star ratings. We work with our clients – and their beneficiaries – to develop innovative approaches consistent with our purpose of helping people on their path to better health. It is also important to remember that regardless of star ratings, investing in adherence programs can translate into better outcomes and lower costs. We can help clients achieve both – better member adherence and improved star ratings – through various programs such as our targeted interventions to help promote adherence and close gaps in care, and our retail clinic options that increase access to care and help lower costs. Given the industry’s continuing shift from a fee-based setting to an outcomes-focused environment, an organization-wide approach to improving quality can deliver truly breakthrough results for the people we serve. PMPY Sources: Roebuck MC, Liberman, JM, Gemmill-Toyama M. Brennan TA. Medication adherence leads to lower health care use and costs despite increased drug spending. Health Affairs. 2011:30(1):91-99.Caris G, et al. Impact of medication adherence on absenteeism and short-term disability for five chronic diseases. J Occup Environ Med 2012 Jul:54(7):792-805. Data shown is for illustration purposes only. Not specific to Medicare population. Actual result may vary. Client-specific modeling available upon request. 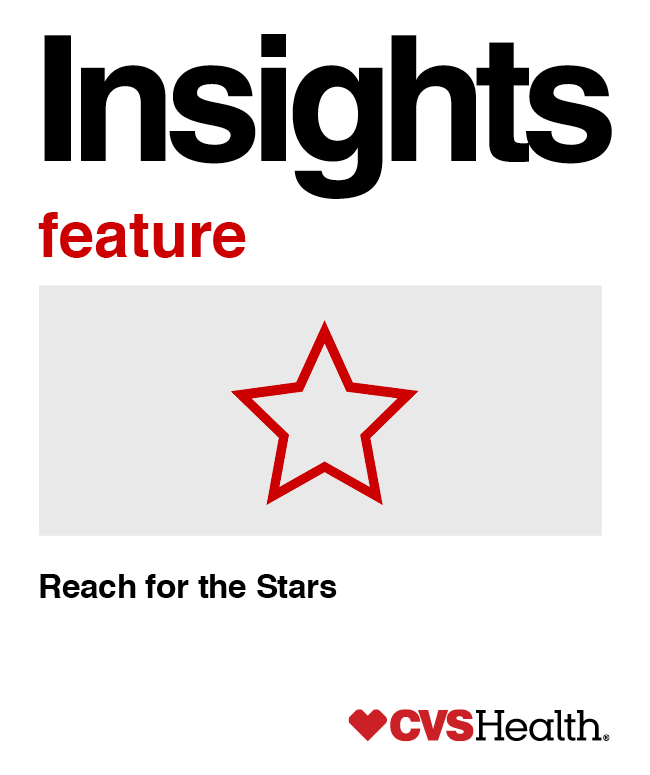 For the 2016 star ratings, 69 percent of CVS Health clients were high performing – more than four stars – up from 42 percent that were high performing in 2015. In addition, CVS Health now supports eight Medicare contracts that achieved a 5-star rating on their Part D score, double from the four plans that achieved five stars in the 2015 star ratings. The proportion of lives covered by high performing plans supported by CVS Health was also up – 73 percent in 2016 compared with 53 percent of lives in 2015 star ratings. In 2016 stars, our clients also saw improvement on key measures supported by the PBM; 100 percent of clients that fully delegated Coverage Determination and Appeals services achieved five stars on the Appeals Autoforward measure and strong performance is expected to continue with the release of the 2017 star ratings. Actual results may vary based on factors such as programs adopted by the plan. Client-specific modeling available upon request. CVS Health uses and shares data as allowed by applicable law, our agreements and our information firewall.